December challenge - just made it! This is a piece of hand dyed fabric- Oz Dye in fact! It lends itself to this design, even though the centre is not done yet. Unfortunately the colour is a bit off, the top one is the best representation. I have taken to using 2 layers of batting lately, it does give better puff/loft, this one is a polyester, and even though is a bit stiff, I like the effect. I did find that as I had no seams a few straight lines along the borders made a difference to the final effect. The thread is a mixture of polyester variegated and Wonderfil. I am off for a few days to the beach, on the way back will stop at Ikea for new cushion inserts so I can use it. I have had such fun with this challenge, will try to post the whole years work when I return. Thanks Sew Cal Gal for the inspiration!! Simons crunchy fried chicken, just what we needed to use up the buttermilk in the frudge- yum. This carved woodblock is what my lovely children bought (together) for my christmas present- what a lovely treat. now to play with it. I have much to do, some quilting for the December Sew Cal Gal challenge, about to start that now, then prepare for a few days away at a beach with my husband. It will be nice to get away for a few days to relax, walk the golf course and generally chill. Keep watch for fun pictures of work about to appear in the next few weeks! Hmmm, Christmas can be a strange time, family, friends and work - for those of us fortunate or unfortunate enough to have a job that needs to be done 365 days a year. These days it is mostly friends that keep us sane and happy at this time as family live a distance away and I have a job that requires one to work some xmas days(I did have last year off). A few lovely dinners and lunches with friends last week- good times. a lovely xmas lunch with friends and then extended family xmas dinner which was nice, they don't mind if I sleep on the couch as I have been at work since 7am! Working with people who you would otherwise not spend much social time with, at what is traditionally a 'family' time is special, we share the good times and the not so good, we share - food, fun, workloads. I am priviledged to work with such fine people. A good, if not interesting day was had by all. I have been inspired by Peters aunt, she is a quilter and provided me with just what I needed before I slipped into uncounsciousness on the couch on xmas day (it was 8pm). QQ challenge I am prepared! no showing as it is a secret. After 3 weeks overseas with my daughter, and a very busy first week back at work, I have succumbed to germs, there are worse things to bring back from France than a midle ear infection, although it is not pleasant- hope the drugs keep on doing miraculous things. On the quilting front- nothing much is happening, in my absence my lovely husband tidied my sewing room! he mostly just put things in boxes, I knew where almost everything was before, now I have to wade through boxes to find things....... I suppose he thought that he was helping.... but it needed a few things to be thrown out, so now I have to go through his boxes and find things....... not overly happy with that. my sewing table- a mess! I have many projects to finish and some to start. The Queensland Quilters have revised the deadline for next years exhibition, it is a bit earlier, and I have grand plans for another overseas holiday, with my husband this time. So it will be head down soon to get onto some serious sewing. QQ challenge fabric- waiting for inspiration to grab me! 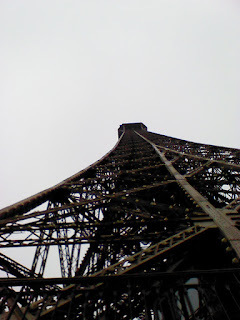 I spent a lot of time looking up during my holiday, lots of fantastic ceiings and wrought iron work, so inspiring, maybe some quilting designs to be made, this is one in Paris. This is one of the best meals I had overseas, it was in Nice, the jar had a layer of shredded duck, hot mashed potato then caramelised red onions on top, a nice salad, baked cherry tomatoes and a curry flavoured pastry - of course a glass fo wine to help it all go down, the presentation was great, all served on a tile! 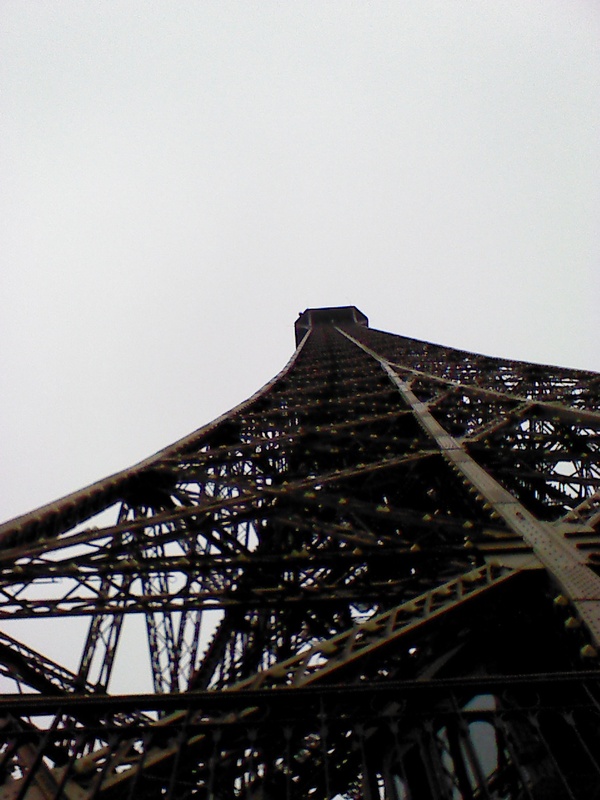 Today we went in the cold up the Eiffel tower, an amazing view. We also discovered that you could spend the whole day riding the metro for a very small fee! We didn't but you could if you were extremely bored. A little shopping expedition, tried to buy jeans as kind have got a hole in the back! Bought other goodies too. One more day in Paris then off to nice. Dinner might be bread and cheese again. 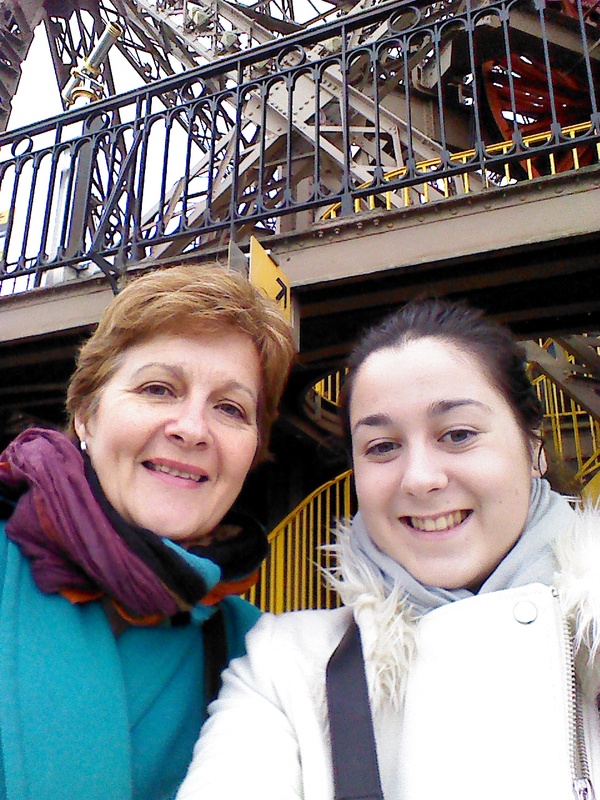 Today we went to sacre couer it was wet, had to buy a hat and new umbrella. Then went shopping very restrained, Notre dame to keep dry, then more shopping and nice lunch with a warming glass of wine. The champs Elysees Xmas market took a while to negotiate, and we only did one side, saving the other for tomorrow night, mulled wine to keep me warm still. Then James Bond. 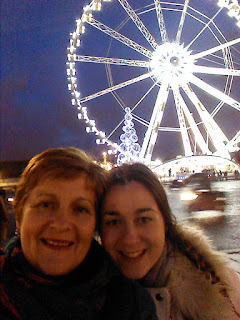 A ride on the free is wheel, which is not my favourite thing but I managed well. The view was worth it. Off to the Louvre tomorrow so must go to sleep now to be ready to start the day as Isabel is tired..
Today is our first full day in Paris, we have had a week in London, busily seeing sights, some train travel and some bus tours. Went to oxford, bath and other exotic locations, saw some flooded rivers , luckily no problems for us. Paris is amazing, so many fantastic buildings and sights. Went out foolishly in the sun without coats, had to go back to hotel and rug up! Mastered the metro! Managed to buy food and tickets etc with very poor French. Can't post a picture but happy that Isabel has taken hundreds of pictures to show when we get home. Off to Paris Disneyland tomorrow. The November sew cal gal challenge has been beckoning me all week, now its done! I used 2 layers of batting and some backing fabric left over from my last quilt. I also used some polyester thread, its a 40 or 50 weight fine and shiny. The effect with the drawn lines is god for the spirals, of couse if this was not a sample I would have made them with brush off chalk. The second piece is better to see, only one layer of batting. I am in holiday mode, off to Eurpoe with my daughter this weekend, leaving the boys at home. Its nice to be on hoidays although this is the first sewing I have done, just running the house has kept me busy along with a killer session at the gym. More when I return from my holiday! Here is my October Sew Cal Gal challenge, an experment with pencils and irridescent textile medium, of course quilted first. The pencils make a big difference, this is not a show piece, but a sample of my attempt to colour and shade a little. Ok so I did not read the instructions properly, I started it at home then did some at the craft fair, playing on a brand new Bernina 710, it was fun. Of course the background fabric does make the pencil colour a bit different, and my shading is woeful, but you have to start somewhere! A better brush for blending is the answer, and of course not black but blue or brown might be a better chice! What is interesting is the flat effect from the plain textile medium in the orange swirls. An interesting thing to note is that I can't get away from feathers! It is not quite finished yet, but I have a long list of things to do before I go to be as I am on night shift tonight. 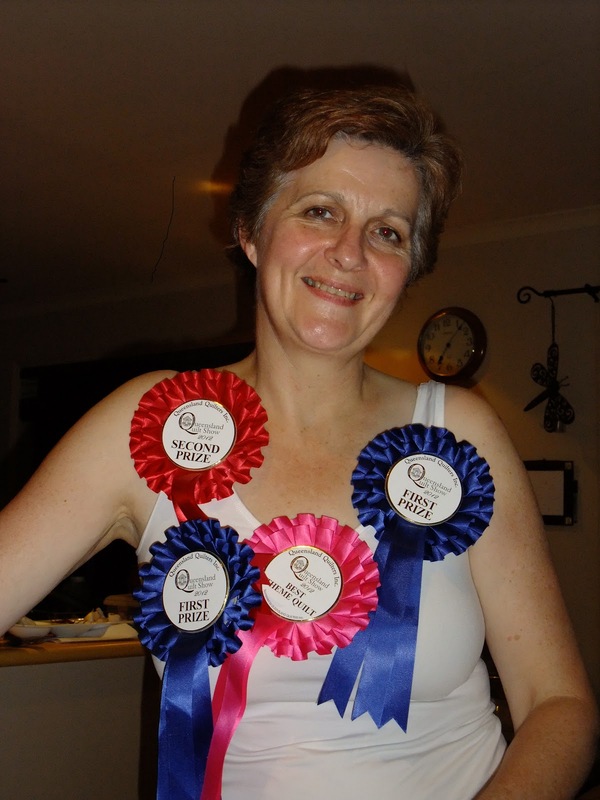 Here I am with my new ribbons! a little excited, there is strong competition in the professional category, so I am pleased to have come home with something. I have also purchased some new paints and pencils and some irridescent textile medium to play with- such fun, this is my Sew Cal Gal challenge piece, almost finished. Now to get next years pieces on the way to getting finished, I do have some quilts in progress that need to be finished!- so they are the first to be worked on when I have tidied the sewing room and done some paid employment! 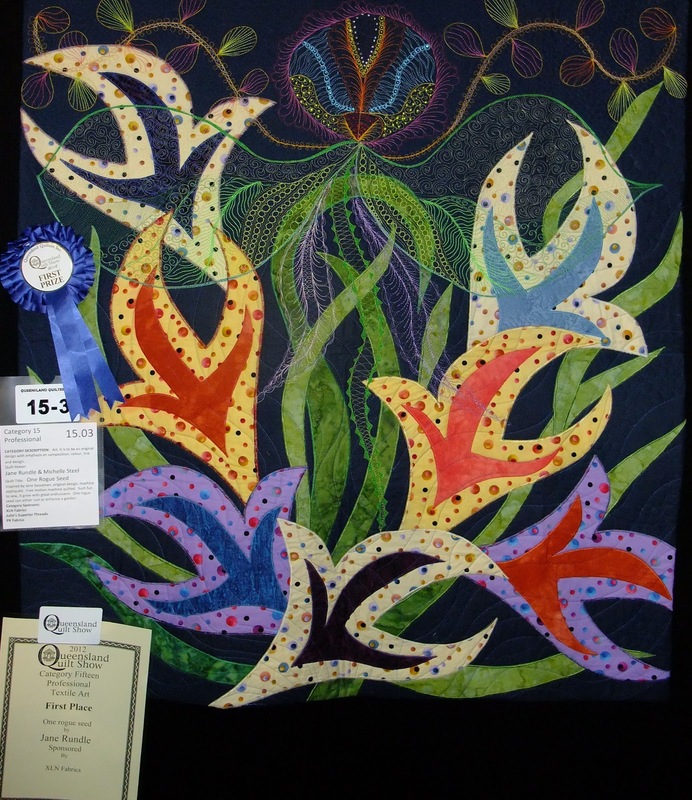 This week is the Queensland Quilters Inc annual show, I have put in 4 entries , one a collaboration with a friend- that quilt did not win a prize but the other 3 won 4 prizes in all. I am really thrilled to have won in such good company. 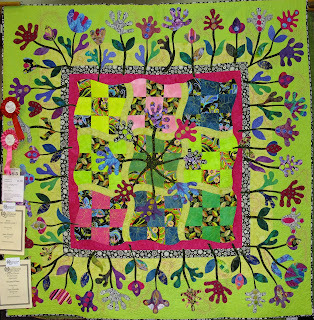 This quilt won First Art Techniques and was a fun quilt made after being inspired by Jane Sassaman, an original design of large spiky flowers ?weeds! heavily machine quilted in a variety of threads over the top, with some sparkly iron on sequins to shine, my heated appiicator broke, so I ironed them on - seemed to do the trick. The spotty fabric I won a number of years ago in a quilt show in Tasmania, it has served me well and is a great fabric to use. The theme this year was Nine Patch, this is a baisc curved nine patch in a larger nine patch, appliqued original floral designs in the centre and round the border, heavily machine quilted. The centre flowers are trapuntoed, maybe doesn't show as well, but I wanted to try it. The border quilting is both pink and green thread in my favourite feathers, all free motion with only the spines drawn on as I went so it is really original. This quilt won Second Pprofessional Applique and the Theme quilt. The mandala I started briefly in a class with Kim Bradley, I used a drawing from a childrens website of copyright free mandalas designs as a skeleton, then contiuned to draw and expand the idea. It is one piece of Lisa Walton hand dyed fabric, stitched on my beloved Bernina (which is overdue for a service), then coloured with Faber Castell watercolour pencils dipped in fabric medium. There are better pencils and pens for this job, my aim is to do some research over the next few months and find out all about fabric painting etc. Trouble cropping this one, but have to go to work so cannot linger on a silly computer program! This quilt won Ffirst Small Quilt. This week is the annual craft and quilt fair, I am going tomorow to help set up, then Wednesday to do a demonstration on the Queensland Quilters Art Quilt table. I have been looking for small and easy things to do, if the other person demonstrating wants to use the sewing machine I will be a bit lost, but maybe not! hmmmm, not sure about his one, but it may be the star of the show soon! Using some fun bright fabrics and a random freeform cutting method I hope to create another quilt with these orphan blocks. Will wait and see if I have won any prizes, then I can show my quilts! I am so clever, for many weeks now I have been doing an online cryptic crossword puzzle, sometimes I use the clues and get it finished, sometimes I need lots of clues. Using less than 5 clues gets you a ranking for the day. Today, well it was yesterday, I got home from a very busy night at work, extremely busy, no room at the inn type, and thought I should give it a go as it was just past midnight and a new puzzle would be ready, I did the whole thing, no clues, all done, my ranking today is 11 out of 32, so I am very happy! not that I will make a habit of it this late often, but I am so pleased with myself! I also got my exhibtion quilts in on time, waiting patiently to see the rest of the works submitted and who got prizes and if I did too! The side with the piano keys was fun, I really liked the effect it made. The thread for the border quilting is Bottom line - top and bottom. Some embroidery thread with a nice sheen for the main design on top. I am really enjoying Cindy Needhams class on Craftsy, only regret that I am not in Adelaide this weekend to do a real class at the Machine Quilters Conference, oh well another year when I am not busy at work. Now that I have had a milestone birthday maybe I will be taken seriously! hopefully not though, as life is meant to be fun, when the fun is gone what is left? A whole day off to sew , go to the gym, cook meals, wash etc. But the quilting comes first. A little stretch at the clothes line in between sewing is good for the back. A samlping of mahine quilting, doesn't the green thread look great. Is also exam block week for my daughter, so we are both heads down, bum up madly working at home today. I have had some lovely and generous gifts for my big birthday which had a 5 and an 0 in it. Lots of vouchers for lovely books to buy!!! And a treat or two along the way with a massage, lucky me. Flowers from friends and my work colleagues- a sideways picture. The quilt exhibition entires are due this week, I have one more month to get them finished. All four to be precise, all at different levels of being finished. The first pic is the 2m x 2m quilt top almost ready to be sandwiched- then quilted. It will be done, not entirely sure how I am going to quilt it, but it talks to me when we are together so I think it will be OK.
We have 2 birthdays in the next weeks, my husband's , then one with a 0 and a 5 for me, so a bit of celebrating and a lot of quilting. A lot of quilting- what do I want for my birthday?- endless days to quilt and not other stuff -like housework, paid employment which is a bit of a nuisance at times- new parents- "the midwife cannot teach you everything you need to know in a 2 day hospital stay- do your research before you have the baby!!" This is a blurred sneak peek at another piece that is almost done, I am queen of the last minute and will use my time wisely- going to the gym amid the chaos to loosen the shoulders and free the mind. 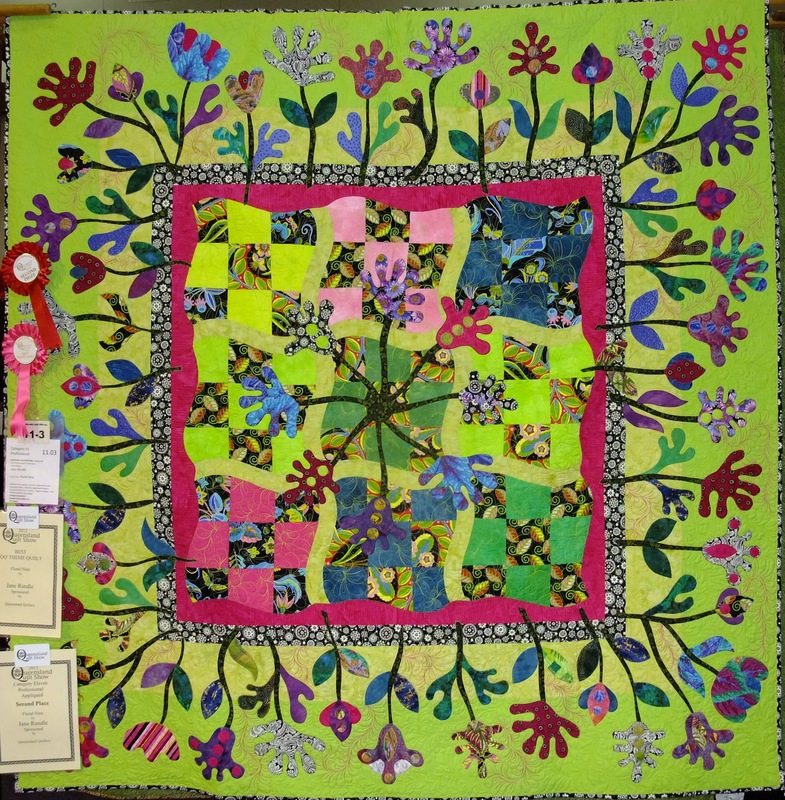 I had a lovely letter in the post - this quilt has won a commendation at the local show- that is an agricultural show! in Brisbane it is called the EKKA- short for exhibition- a lot of words are abbreviated in Queensland - not sure exactly why - 'ekka' is as long a word as 'show'. Never mind, its a show where other quilters who are not necessarily member so the QQ enter their work. So a different group of entrants and judges makes it interesting. I am off on Monday to do Quilt Hostess so will be able to see all the winners. Now to work on this years QQ quilts- so little time and so much to do. Work- that is paid work gets in the way...we did have a record number of babies on my night shift earlier this week, so I have earned a rest I think- or maybe not- bck on night shift tonight- lucky I have a bag of red frogs in my bag to keep me going! Have been sick then busy at work and in a haze about a few projects. Now it is on, I am inspired by the Row by Row challenge and have started afresh, need to make the first months row again, but now I know what I want to do it will be easy. This is the new fabric, well some that is years old that I found in the cupboard, it will be sort of Modern Quilt like in its style, of course unable to reveal the final row till next Tuesday. The rows will all feature this grey fabric and a few others like it that have been lurking for some time waiting for the right project. Am working on the bundle project too, computer not happy to dowload picture today, so next time, the contents of the bundle are in the sun drying. This is the latest SewCal Gal challenge, took a bit of time as I have been sick and then busy at work, and it is a bigger piece- about to be made into a cushion. Its a piece of hand dyed fabric, with a 'tile' like design, I decided to try to fill all the tiles with feathers, at first I tried small pebbles, but the challenge to myself of filling the spaces with the same design paid off. I did unpick the pebbles and one other sqaure- so time consuming. I wish I had done some simpler feathers with wider spines as they look effective, I do have some thread build up in the spines, but it was a good thing to try to have as a sample. The tutor for this month is Angela Walters. The threads are mostly rayon embroidery threads which have a lovely sheen with Bottom Line in the bobbin. To do the straight lines I used a 6" ruler to hold against the foot to make sure I was going straight, even with a drawn line it is hard to get a straight one sewn but the ruler with the non slip back on it works wonders, I have watched long armers use one and thats why I gave it a try, so easy and effective. Not sure if my "grout" lines are a bit wide? mabye for another project to make smaller ones. I have been doing the Queensland Quilters Teacher accreditation course this year, an interesting time. I have to do a short- 2 hour tutorial and chose hand/ neeedleturn applique - a Christmas tree postcard. This has involved a lot of work to make instructions etc and samples amidst being away on holiday, sick for a week and of course my paid employment. The resulting cards are OK, but I am ready to move onto the next thing already. I did a Myers Briggs course a few weeks ago- I think its part of my personality to go onto the next thing before I have finished with the current one. I discovered that you can iron on the small heat set sequins- the battery operated device I bought does ot really work, but a few randomly placed sequins on the cards and some Glad Bake and they all set really easily. Oh well, now for the next SewCal Gal quilting challenge, hopefully tonight and it will be done. As part of the Queensland Quilters night group I am managing a challenge called QQ RRRR (roosting robin row by row) this is a project where you make your own quilt but within the row challenge themes set each month. Size is at your peril! I have lots of scraps and want to use them for this project. Doesn't help that I have a nasty cold/viral thing and feel very ordinary. I have chosen some farbic and cut some squares to sew together, have also trawled the internet and my boks for paper pieced patterns to use, as the scraps are small I need a small pattern, I have chosen this one from EQ5 as a 4" block. Not sure if this grape vine floral will be a feature fabric and the connection between the rows? Maybe this quilt will be for me, maybe we will buy a caravan and this will be its quilt?? The first row needs to be finished by tomorrow night. We have been travelling- to Melbourne and back- by car, a long drive, went through lots of pretty towns, saw lots of long stretches of road, and just when you got bored- a view like this comes along. Amazingly still water. Knitted almost a whole sock along the way- not really helping with my quilting, but did keep me entertained while husband drove. This is for the Art Quilts Around the World group. I love green, even though I did a pink piece the last 2 times for the Sew Cal Gal challenge, green and orange are my colours, and of course red! Staring out with a simple 9 patch block, inspired by Rayna Gillman and Gwen Marston I did some deconstructing. This was pure fun, I did learn some things along the way- now I will read Raynas book! I will use this technique again, not entirely sure which way up it goes!